Improved productivity requires accurate identification of pests in potatoes and also in the cabbage rotation crop. As well as helping Indonesian farmers this information will assist WA seed potato exporters understand the challenges their Indonesian customers face. Indonesian name for leaf beetle is 'kumbang daun' and the scientific name is Phyllotreta striolata. Leaf beetle adults are 1.5-2.5mm long, shiny black with a greenish tinge with wavy yellow lines running the length of the back. The large hind legs allow beetles to jump. Eggs are laid in the soil near plants and hatch into white larvae which live in the soil. Larvae have brown heads and three pairs of legs. Mature larvae are 3-5mm long. Larvae form white cocoons in the soil, about the same size and shape as the adult. Leaf beetle larvae live in the soil, feeding on the roots of host plants, but are not considered pests. Adult leaf beetles feed on cabbage plants making small round pits in the cotyledons and leaves of young plants. If they are present in high numbers, they can kill plants. Seedlings are very susceptible. Some varieties of cabbage are resistant to damage by leaf beetle. Enquire as to whether any are available in your region. In regions where leaf beetles are a consistent pest, systemic insecticides applied to the seed can protect seedlings for up to five weeks after emergence. Monitor crops weekly for beetle damage to leaves especially during early stages of crop growth when plants are more susceptible. Leaf beetles may invade at crop edges and only these areas may require treatment. Apply foliar insecticide to protect plants when 25% or more of leaf area is damaged. 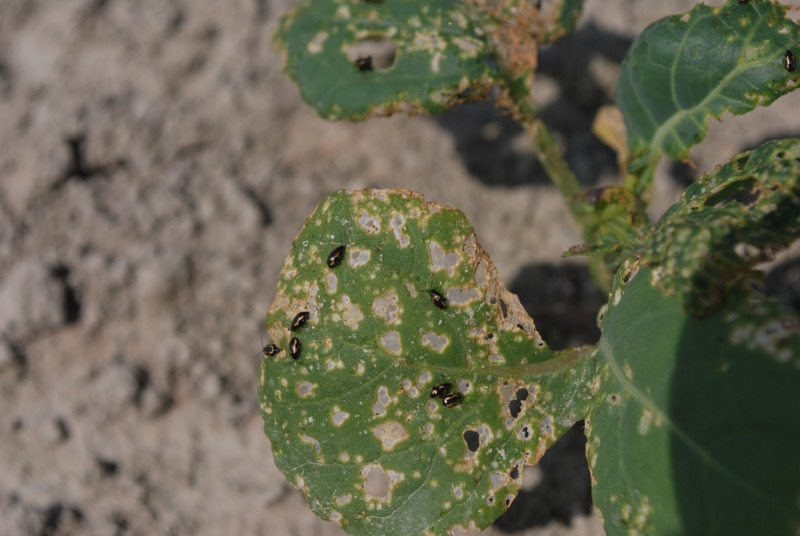 For control of damaging numbers of adult beetles, apply a contact insecticide that will have minimum effect of natural control agents that help to control leaf beetles and other insect pests of cabbage. Natural enemies should be encouraged. Funding for this work to support Indonesian potato farmers and WA seed potato exports was provided by the Australian Centre for International Agricultural Research (ACIAR) and the Department of Primary Industries and Regional Development, Western Australia.